Kevin When you get to Fulton Ky take State Line West two mile Im on the left. Did ja pack da skies? Got em waxed and packed. You've shown us bits and pieces (maybe I've missed part of the story) but I wanna know more about what's taking place. Are you building a cabin out in the boonies? How far off the beaten path do you go? When you go back in there to saw, is it just for the day or do you spend more lengthy periods? Do you take some crackers and pickled balogna with you? My wife makes me a lunch. The lumber gets stickered and stacked. 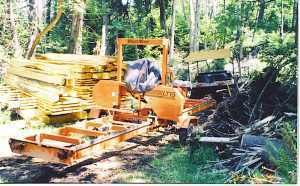 Depending on the trail, the mill gets hauled on skis or wheels early in the Spring and stays in the bush for about a month. The property is about a kilometer from decent roadway. I go in on the weekends and mill. It's my own very wet,woodlot. I don't sell the lumber as a rule but use it for my own needs. I have the mill set up in the driveway now at home, similar to what Mark is doing. We'll be getting some heavy snow and cold weather soon so the mill will be under tarp until Spring. Kevin, Do you use the argo to skid logs? If so, hows it work? 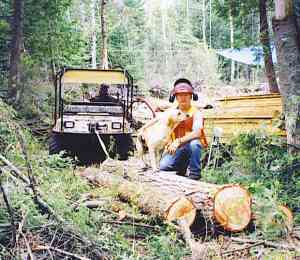 I winch the logs out to the trail then hook em to the log arch in the picture. No problem skidding with the Argo. Kevin, is an argo about the same thing as a Gator? And is one better then the other? Also, how are they on hilly terrain when dragging a large log? Thanks! I'm not familiar with the gator. The Argo is amphibious, comes in 6 or 8 wheels. I have the 6 wheel and the problem pulling a heavy load on a hill is getting traction as it has plenty of power. When pulling the LT-15 up the one steep muddy hill I have to use the winch because I can't get traction. You can also get tracks for it. On the flats it will pull a good load and works well on wet ground where an ATV can't. 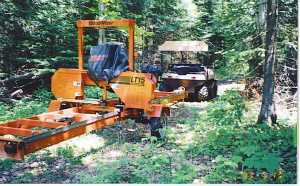 It has skid steering and will turn on a dime which makes it nice to operate in the woods. I've had some experience with both. Not necessarily in the Forestry end of it. Each has it's application. You can get an Argo with 6, (3 on each side) high ride tires which gives you higher clearance. Additionally, they make a set of tracks that fit over the tires like a dozer, almost unstoppable. It floats, , has a winch option, and a outboard motor mount for those really deep puddles. Drives like a dozer with hand brakes. I've driven them over some tough , wet, hilly terrain and pulled ATV stuck up to their seats, outa mud. Gators, in my opinion, aren't as versatle. Certainly have their application. I use a 6x4 with a dump body. Plenty of power. But when it comes to the wet stuff,don't hold a candle to the Argo. Argos will hump logs that a gator will not.If you can get the front tires on it, it will usually climb and go over it. Tough on the kidneys sometimes. Argos are more expensive. So, it boils down to your needs and application. BTW, an Argo will literally, turn on a dime. I can winch some pretty big logs with it. I'll start the winch and feel the pull on the machine. When the log gets stuck the machine starts to pull ahead letting me know the log is stuck and I stop winching and free it. Someday I hope to get one of those Agros. Right now there is one in the paper for sale. 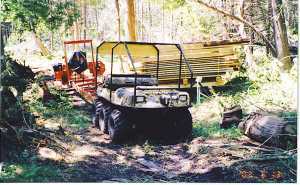 It is an 8 wheel unit with cab, heater, winch, and has 37 hours on it. The asking price is $9900. Kevin and Rick, thanks for all the info! I've been thinking about getting a Gator, never seen an Argo before so I'll have to look around and see who carries them. Thanks again! 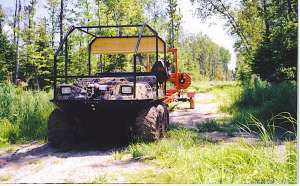 I was looking for a dual purpose machine, a machine I could use for hunting and general access to my camp and at the same time a machine that would tow my mill and skid logs. The Argo fit and serves my purpose. They are slow and rough riding but are well suited for crawling through the woods. Page created in 1.144 seconds with 40 queries.